Why, I asked myself, am I doing this? I’ve not slept properly for days, I’m in a town I’ve never heard of before, stuck in the middle of a thunderstorm, looking for a bus to yet another town that a week ago I’d never heard of. Why? 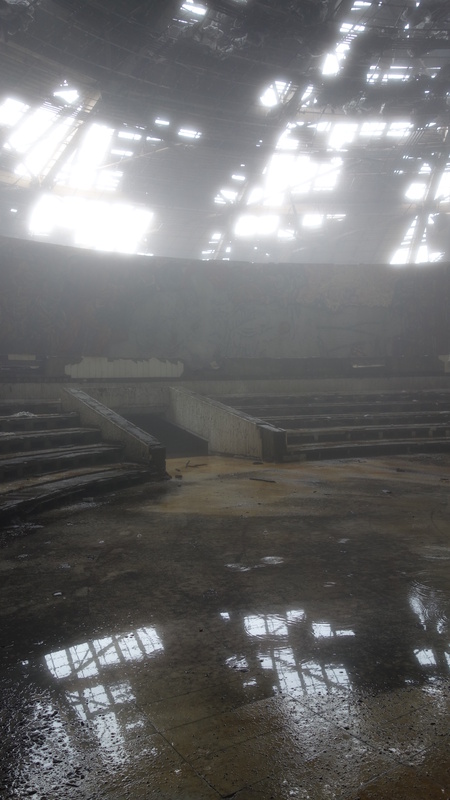 I’d just got off a 5 hour train ride from Bucharest to a town called Gora Oryahovitsa in Bulgaria and was sheltering inside the station as outside the rain came down in sheets whilst flashes of lightning illuminated the gloom outside. I was looking for a number 10 bus to another town called Veliko Tarnova, but there was no sign of numbers on any of the buses outside the station, and a poster board indicated that if there was a number 10 bus it actually left from someway away from the station anyway. I wasn’t supposed to be here I thought. This wasn’t the plan, I wasn’t supposed to be here, I was supposed to be in Istanbul. Well, in actual fact I was “supposed” to be in Istanbul a month ago according the long forgotten timetable I had drawn up for my travels, but this latest plan to be in Istanbul had only been drawn up two days earlier and yet I’d already discarded it and so here I was, on my own, probably about to get very wet and lost instead of being on a bus to Istanbul with a fellow backpacker I had first met way back in Mostar. The rain showed no sign of easing, but another numberless minibus had just pulled up with “Veliko Tarnova” written in Cyrillic on a card in the windshield. Better than waiting in the rain I thought, and I hopped on. 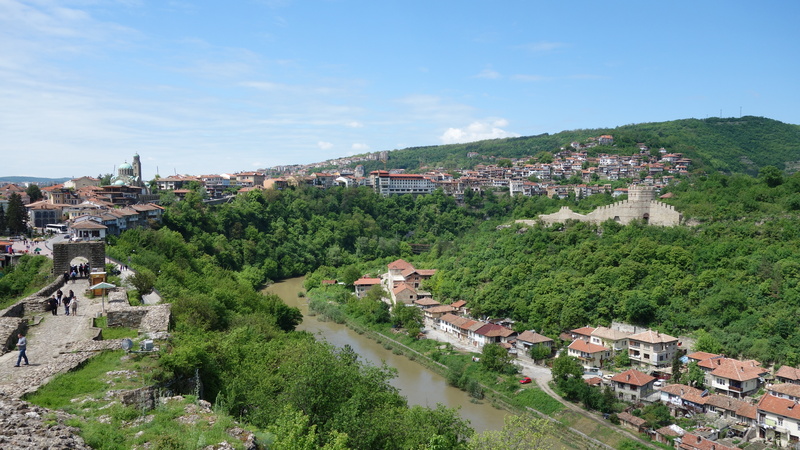 Arriving at the hostel, the girl at reception pointed out on a map the various sights in Veliko Tarnova, the ancient capital of old Bulgaria, but I knew they weren’t what I was here to see. What I was here to see, what I was willing to brave strange towns, confusing buses and torrential rain for, was on top of a mountain an hour and a half’s drive away. 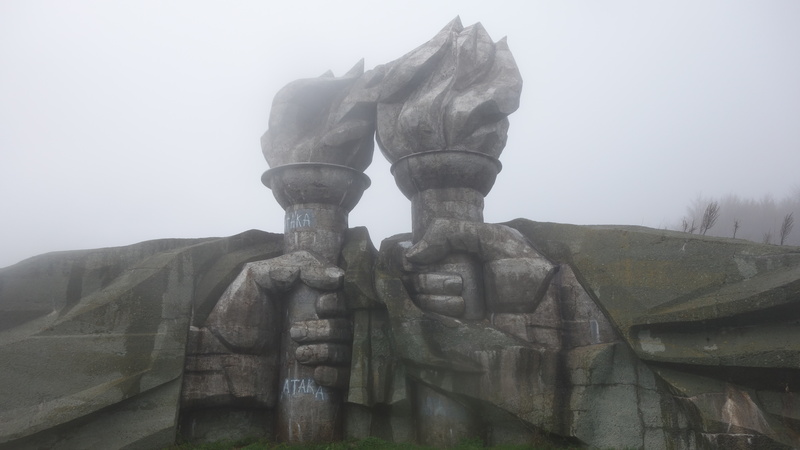 A discarded relic of Bulgaria’s past, left to fall into ruin and apparently so awe-inspiring as to become something of a whispered legend amongst backpackers and travellers passing through Bulgaria. 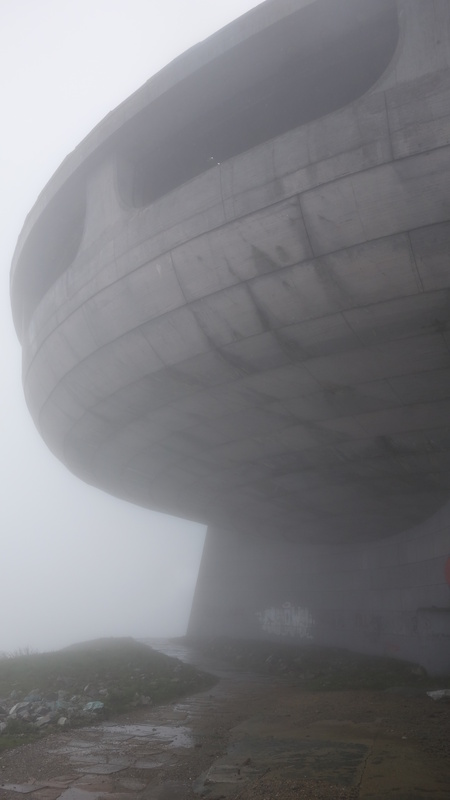 Or to give it its official name, “The House-Monument of the Bulgarian Communist Party“. Or to give it its unofficial name, the “UFO” building. Getting there from Veliko Tarnova actually proved surprisingly easy. At the hostel I had quickly met two fellow travellers, one of which had heard of the monument and another of which I was soon able to convince it would be worth the time and effort to see. Even better, they could drive, so the next morning, a hire car and a pleasant drive along Bulgarian roads later and we would be there. It was fair to say that the next day the weather decided it was not going to fully co-operate. 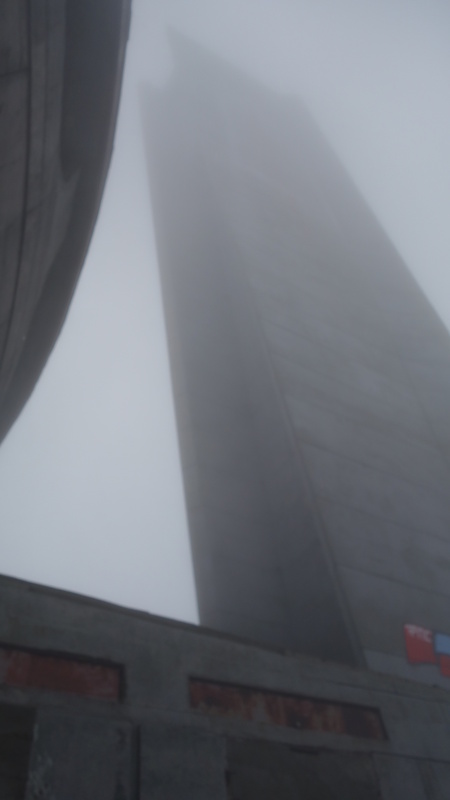 Heavy mist and low cloud meant visibility was minimal. The sight of the monument emerging as you drive up the hill is apparently an awesome sight. Unfortunately I can neither confirm or deny that this is the case as we weren’t able to see the building until we almost drove into it! 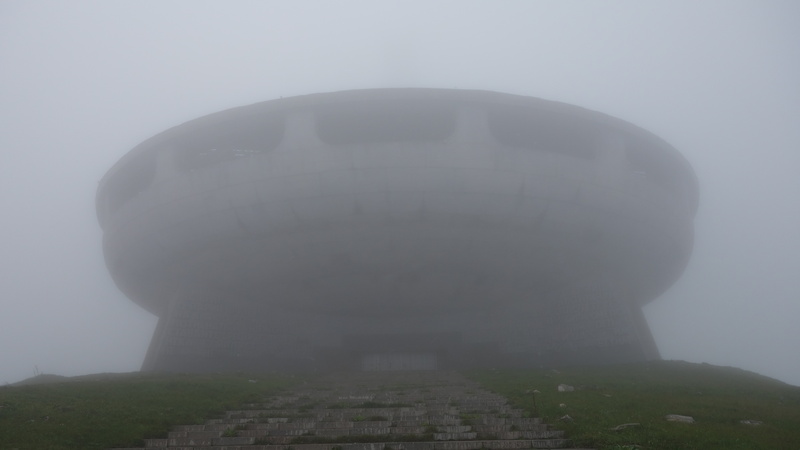 And whilst this, and the wind and the rain denied us some photo opportunities of the views over Bulgaria from the mountain top, it added perfectly to the haunted atmosphere of what is without doubt the most surreal and eery place I have ever been to. 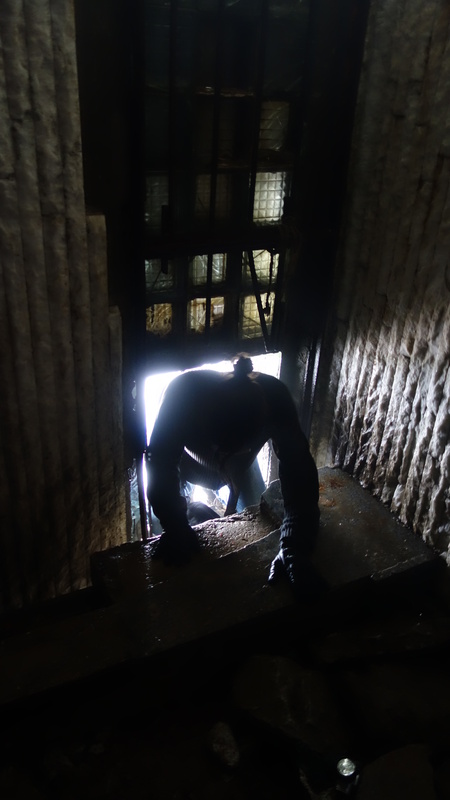 The monument is officially closed to the public, but access is not difficult to find, just right of the main doors, a hole has been made in what I think used to be a window. A pile of stones had been helpfully piled up next to it, so a tight squeeze later, we were in. The entrance hall was, I admit, slightly underwhelming, although with several stair cases leading both up and down it did at least quickly show the opportunities for exploring and get us out of the worst of the wind and rain. 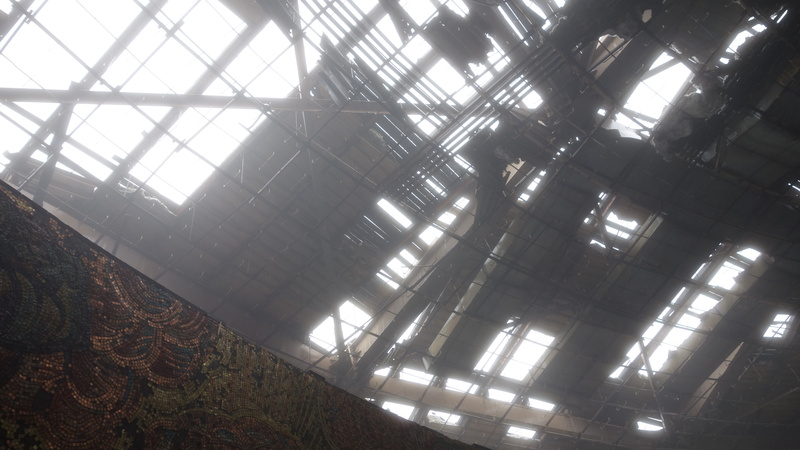 Selecting the main staircase we proceeded up to the auditorium, where we caught our first glimpse of the decaying ceiling, with light, clouds and rain bursting through the numerous gaps. It literally takes your breath away. We had been in the building barely a minute but had the trip ended there and then all three of us would still have happily agreed that it would have been worth the effort of getting here. 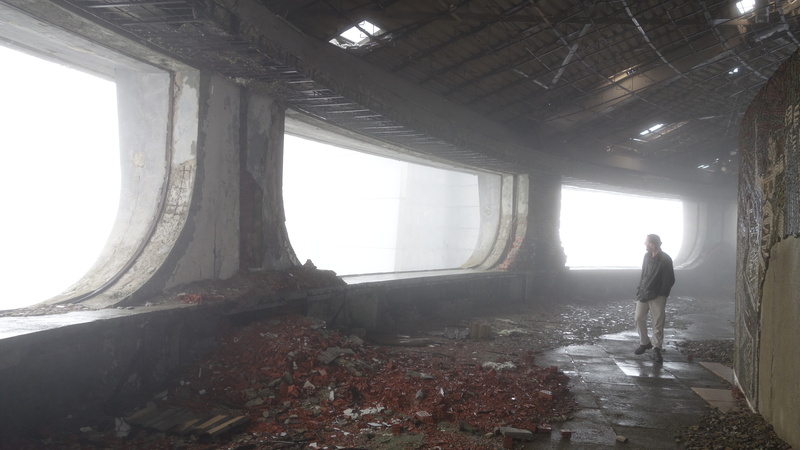 It’s difficult to get across with words just what this place is like, it feels unreal, like you are stuck in a scene in some post apocalyptic film or video game. 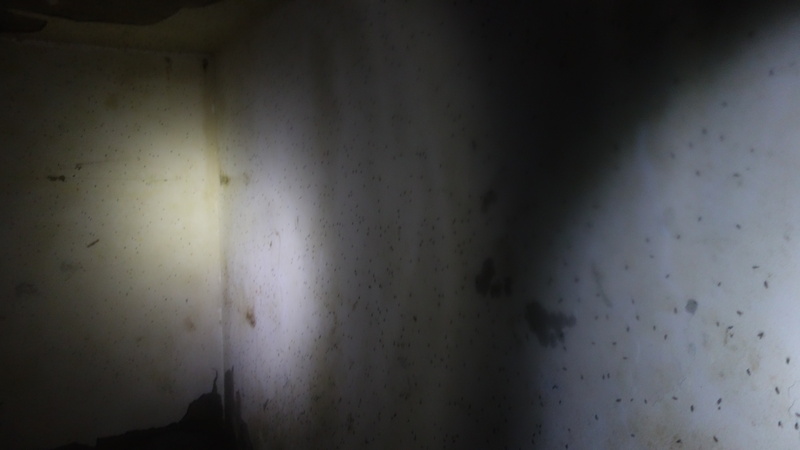 Bits of ceiling hung loose, puddles covered much of the floor and insulation could be seen, both hanging from the ceiling frame and piled up on the ground. 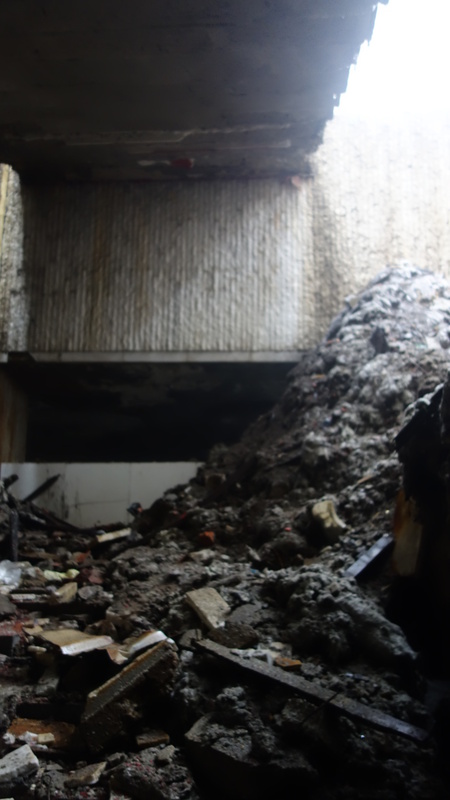 I rather suspected this contained asbestos so we tried our best to avoid it. Evidence of the grandeur is still visible, the mosaic faces of Lenin, Marx and Engels relatively undamaged compared to the faces of the deposed Bulgarian leaders. 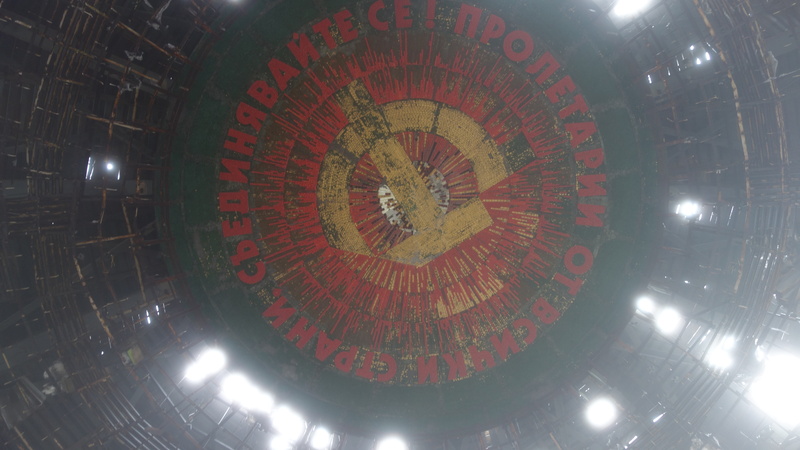 Looking up at the centre of the auditorium, a yellow hammer and sickle can be seen, dulled by time but at the same time, retaining an almost glow like quality. The centre of the room also had another unexpected quality. 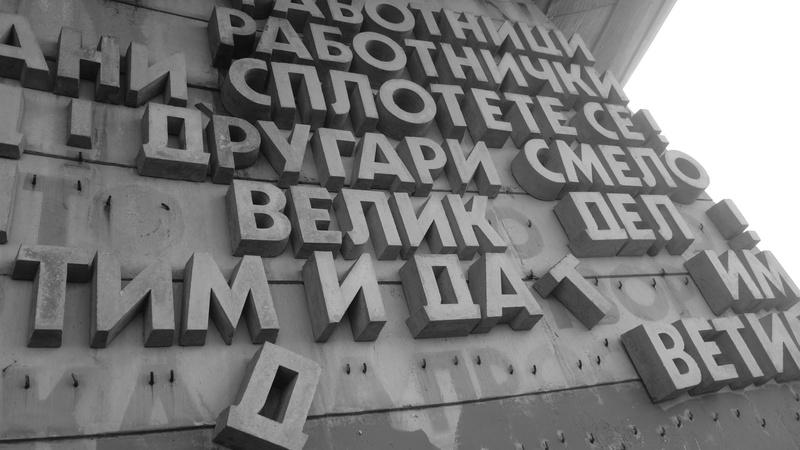 Standing directly beneath the hammer and sickle and speaking out loud, my voice seemed to echo and reverberate around the building several times, as if I had my own backing group. Strangely though, this effect was only audible from the centre, and only affected noise made here. In order to avoid contamination, don’t visit. 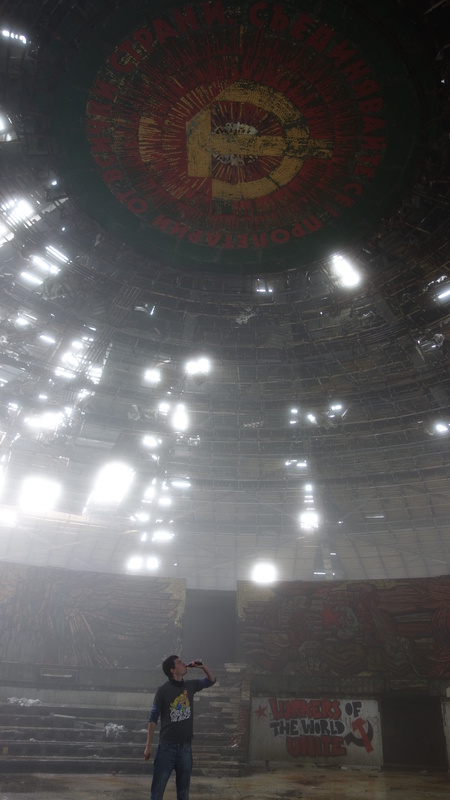 Having decided to indulge in a celebratory Coca Cola underneath the hammer and sickle we went of to explore more of the building. 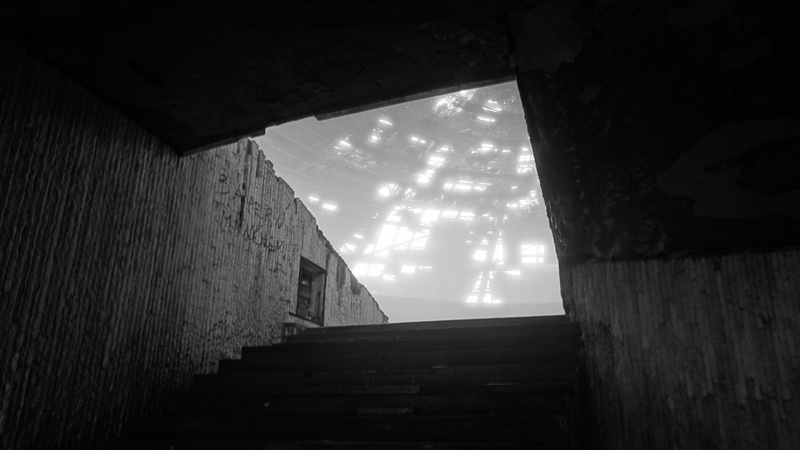 The outer corridor, with its wide panorama windows (the glazing long since gone) echoed the UFO vibe a visitor gets from the outside. Outside nothing could be seen but clouds, giving the impression that perhaps we were indeed in a flying saucer, hiding in the clouds far above the earth below. 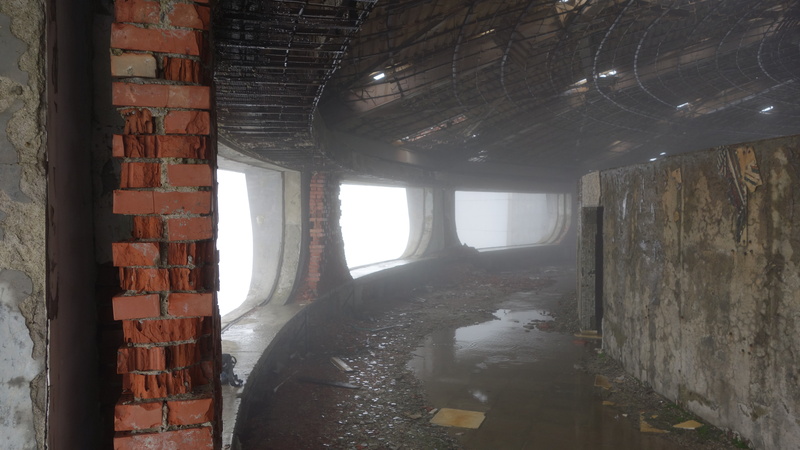 At this stage, still busy taking photographs of almost anything we could, we ran into a group of Bulgarian free-runners who had been exploring the building and we headed off into the basement with them, torches in hand. Here alas, thanks to rain, dust and god knows what else encrusting my camera lens, and torch lights flashing around, you will have to imagine the scene rather than rely on my photographs. 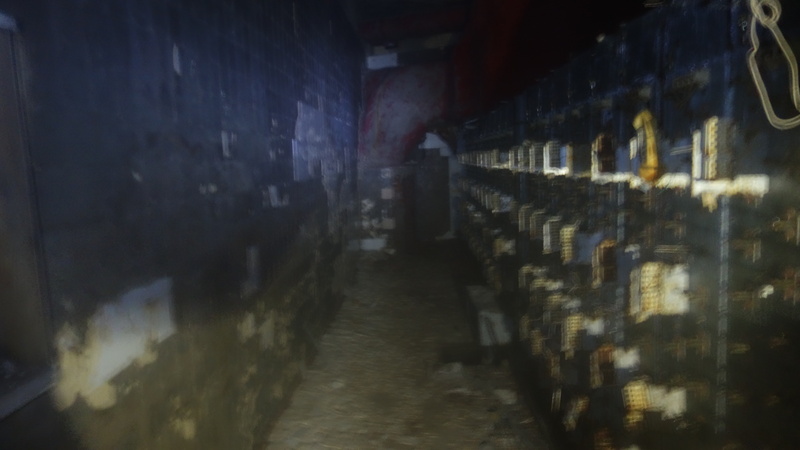 The basement is pitch black and requires a torch to explore. Equipment racks lie empty, doors trampled down, toilets ripped out and taken away and with rubbish and debris littered around. It also smells, and was very wet with several routes blocked off by water. 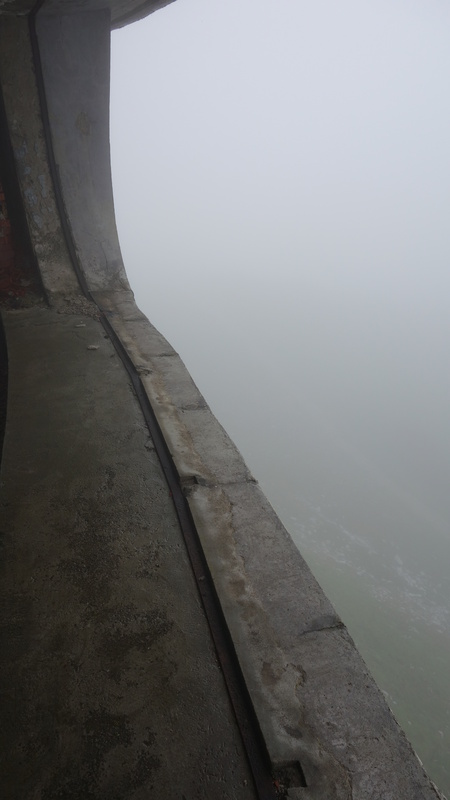 One room seemed to be entirely covered with dead flies….We found the stairs/ladder to the top of the tower attached to the main building, but elected not to climb, given there would be no viability outside and that our hands were going numb with cold. And so, and several hours after we arrived, and with a final look round the auditorium, we left, back through the hole in the wall to make our way back to the hostel, stopping to pose by another typically understated piece of communist art on the road just down from the main complex before heading off in high spirits back to Veliko Tarnova and the hostel. I felt energised again. The lack of sleep was no longer a problem. My failure to keep to any sort of schedule was not a problem. Rain, strange locations and confusingly labeled public transport were no longer a problem either.